Participatory art practice has been explored vigorously since 1920's through Dada, Fluxus, Situationist International and even internet art and social network contents in recent years. My research focuses on finding theoretical background and method of participation as well as the effect. 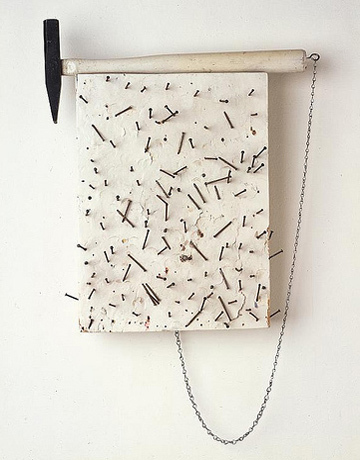 Yoko Ono "Paint To Hammer A Nail" (1961) One of the examples of DIY(Do It Yourself) art. DIY art suggests artist as a mediator. She provided instructions for the work to be created. Hammer a nail into a mirror, a piece of glass, a canvas, wood or metal every morning. Also, pick up ahari that came off when you combed in the morning and tie it around the hammered nail. The painting ends when the surface is covered with nails. The efficacy of audience participatory culture has been realized and applied in theater and music performance as well as adopted in various presentations and educational institutions as a learning tool. Professor Seymour Epstein states in his Cognitive Experiential Self Theory (CEST) that people process information through an unconscious, 'experiential system' and a conscious 'rational system'. An experiential system makes more direct connection to people through the unconscious mind and stays longer in memory than a rational system. In the more traditional audience participatory setting for a musical performance, the performer explains a rule or call for action, and the audience members respond. Usually, these types of verbal communications are simplistic. However, they pose a risk of losing audience interest if the rules are long and complicated. Moori provides an unorthodox protocol between a performer and audience members. The system allows users to dynamically send and receive information through a phone interface and then invites audience members to create poetic narratives as well as the sound and visual. Since the communication happens through a device, the performer does not need to communicate verbally. As a result, participatory performance continues without any interruption. Interaction between a performer and audience in a show can be characterized as a social occurrence where audience members interact with a performer directly or indirectly. Holton and Strauss categorize performer-audience interactions in a show in three different types. They are personal, vicarious, and parasocial interactions. Personal interactions refer to a direct and reciprocal interaction. Repetitive personal interaction between a performer and audience members can lead into a ritualistic behavior. Vicarious interaction is best exemplified where spectators give themselves an active role to assimilate to the performance as in a theater production. Lastly, parasocial interaction associates to large audience situations such as mass media or television. In this case, a performer has no direct relations to audience at all. However, audience members assume that the performer's attention is directed to them. Audience participation was necessary in early music hall days. In the pre-amplification era, in order for a performer to entertain a large crowd where no microphone or a loud speaker existed, the performer had to provoke the crowd to chant, sing along, or shout. This kind of audience participation is not required in present days. The audience-performer interactions take different forms based on types of music and crowd at the event. For example, at a classical music concert the audience responds to performers in a subtle manner, whereas at a hip-hop concert, audience reciprocates to a performer by dancing and shouting. Many performers in various genres of music have exemplified effective audience participatory cases. At the World Science Festival 2009 Notes & Neurons Panel, Bobby McFerrin demonstrates the efficacy of audience participation by instructing an audience group to sing a note according to his moves. After a few repetitions, the audience memorizes the entire pentatonic scale of notes. Subsequently, McFerrin sings a melody line while directing the choir of participants to sing base notes with his movements. As a result, the panel becomes an intimate and playful event. An interactive performance, Big Screams by Elie Zananiri is an audience participatory performance implementing SMS service. 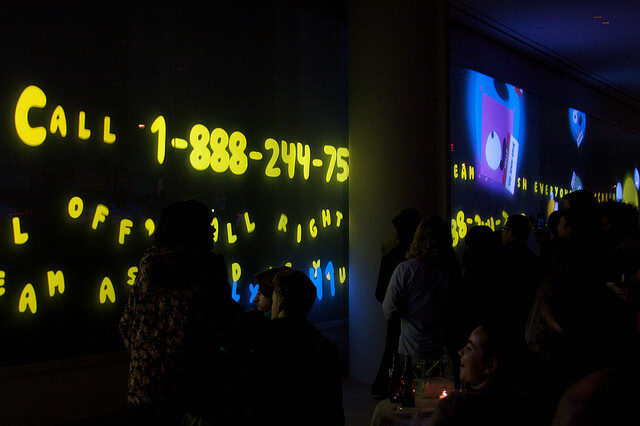 In Big Screams, the artist asks users to call a number displayed on the screen. As the call is made, a critter with the user’s nametag appears on the screen. A user screams into the phone to keep his or her critter floating high and repel all other callers. The loudest screamer wins the game. And if the user’s critter falls off the screen, the participant needs to call reenter in the game. This work brings out whimsical and engaging experience as the space becomes filled with people screaming into their phones. A music performance, Dialtones [Figure 2] by artist Golan Levin and his collaborators utilizes audience participatory formation. Dialtones employs audience mobile phones as an instrument. Levin alludes that the usage of mobile phones is prevalent in our society, nonetheless the sound of the phone ring is often perceived as indignation. By inviting the audience into a captivated concert situation where the only sound performed is various phone rings, Golan attempts to transform the audience reaction to the sound. At first, participants are engaged in the playful activity, and eventually begin to appreciate the aesthetics of sonic cacophony. Prior to the concert, audience members are asked to register their phone number and model number of their phones, which are then stored in a networked database. Consequently, A RTTL formatted ring tone (created by the composer) is sent to user’s mobile phone via SMS, and a seating chart is generated. 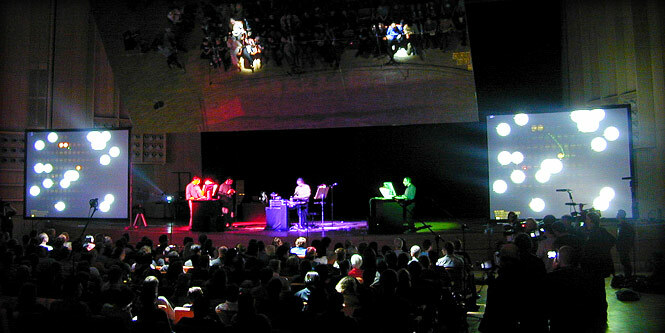 During the concert, a phone number is drawn computationally based on the composition, and the system calls the number. Subsequently, multiple spotlights, configured exactly to the coordinates of the seating, light up in the audience seat whose phone has rung, and the audience’s image is displayed on a large projection. Another great example of audience participatory performance incorporating mobile phones is Simple Text by Jonah Brucker-Cohen. Three networked computers create computational based audio-visual work derived from incoming SMS messages from participants. In Simple Text, a user’s text data is received on the system computer through the artist’s mobile phone via a serial connection as well as on the web though a PHP script. The text message is parsed and sent to the music computer to create a generative music while searching for images on the web on the visuals computer. The system computer is also projected and displays the retro ASCII status on the projection. As a result, audience members are able to monitor messages received along with immediate audio and visual feedback. During the event, audience members are encouraged to interact with other’s messages promoting a collaborative environment. Moori adapts similar concept, of which live audio-visual content is created by audience members through a mobile phone interface. The user’s narrative content drives Moori’s visual component while also influencing some musical elements. However in Moori, users can also directly generate and control graphics and sound. As the concert begins, the performer starts the background music, and sets the tone. Questions appear on the screen as well as on the participant’s phone interface one at a time. As an audience texts the answer back to the performer, a small musical phrase is generated based on ASCII values in the sentence while a computer voice sites the incoming message in audio form. Simultaneously, the answer appears on the screen as a string of letter particles, and then fades away shortly after. 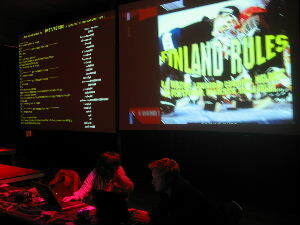 As participants contribute their comments, the screen becomes filled with text, and the sound develops with generated voice and tones accompanied by the background music. Artwork is the result of a conceived notion of a creative process. In a participatory work, a performer sets up the scenario. However it is the audience who unfolds the narrative in reaction to the given settings. In other words, the artist becomes merely a mediator who provides a background and the outcome is unique to each performance. When the form is exposed to an audience, the controllability of the work becomes more vulnerable and the intention of the artist is put to a risk. Moori is heavily influenced by Fluxus works, which represent “change, flow, and intimacy” . Some exemplary Fluxus audience participatory performance pieces have been closely examined during conceptual process.